This week marks the beginning of summer—family reunions, barbeques, and beach vacations— for those who can afford it. Those who can’t include hotel housekeepers, who like many U.S. workers over the past three decades have seen the standard features of a middle-class lifestyle grow even farther out of reach while productivity has more than doubled. When you check into your hotel this summer vacation, remember that the average hotel housekeeper cannot afford the price of a hotel room with her day’s wages. As of 2014, hotel housekeepers’ wages only covered 74 percent of the average cost of a hotel room. Note: Inflation-adjusted average wages for hotel housekeepers grew 34 percent over this period. Source: Average room rate, 2014: American Hotel & Lodging Association (2015). Housekeeper daily pay since 1997 is based on an 8-hour day and BLS's mean hourly wage for "Maids and Housekeeping Cleaners" in the "Traveller Accommodation" (2002-14) and "Hotel and Motel" industry (1997-2001). Average room rate, 1967-2013: AH&LA data for 2014 indexed to U.S. Bureau of Labor Statistics' "Other lodging away from home including hotels and motels" price index. For year prior to 1997, wage is based on hourly wage for 1997 indexed to BLS's average hourly earnings of production and nonsupervisory employees in the "Leisure and Hospitality" industry. This was not always the case. In the 1960s and 1970s, housekeepers could afford a hotel room with their day’s wages. Although they are paid somewhat more than the $7.25/hour minimum—the average hourly rate was $10.70 in 2014—like many low-paid workers their pay has been indirectly affected by the erosion of the real value of the minimum wage. 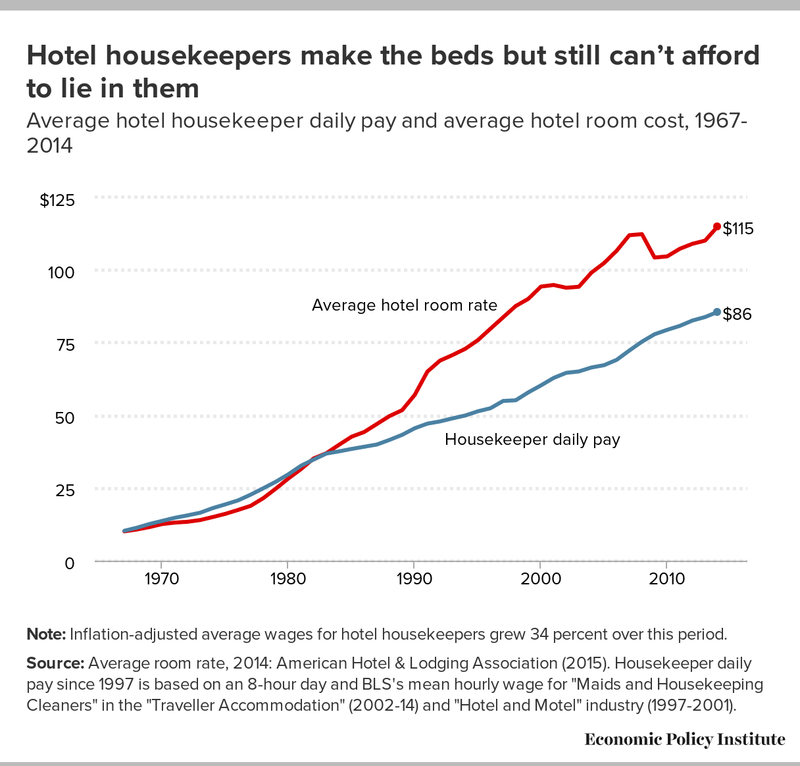 While housekeepers’ inflation-adjusted wages have increased very slowly, hotel companies have enjoyed healthy pre-tax profit margins, which increased from 17 percent in 1996 to 25 percent in 2013 based on available data. Hotel housekeepers need a raise. Housekeepers, many of whom are women of color and immigrants, would benefit from raising the federal minimum wage to $12 an hour by 2020. Stronger collective bargaining rights would also boost their wages, since unionized workers in the industry are paid 19 percent more on average than non-unionized workers and enjoy employee benefits and other components of a middle-class lifestyle. For more policies that will raise wages, see EPI’s Agenda to Raise America’s Pay.